Southern States Sporting Bird Flight Developer (BMD) Medicated is a complete feed for gamebirds and turkeys. Its crumbled form prevents separation of micronutrients to ensure that developing chicks get all the sustenance they need, and its antibiotic additive prevents common ulcerative enteritis infections. Crumbled. Crumbles prevent micronutrient separation and ensure particle size is optimal for consumption. Contains PrimaLac – a direct fed microbial. Enhances feed efficiency and supports the immune system. Gamebirds and turkeys. See poultry brochure for details. medicated. BMD is an aid in the control of enteritis. LIMITATION FOR USE: Feed continuously as the sole ration to growing quail and turkeys. Feed Sporting Bird Flight Developer (BMD) Medicated free choice to growing quail from the age of 8 weeks to release or market weight. Provide fresh water and feed to birds daily. 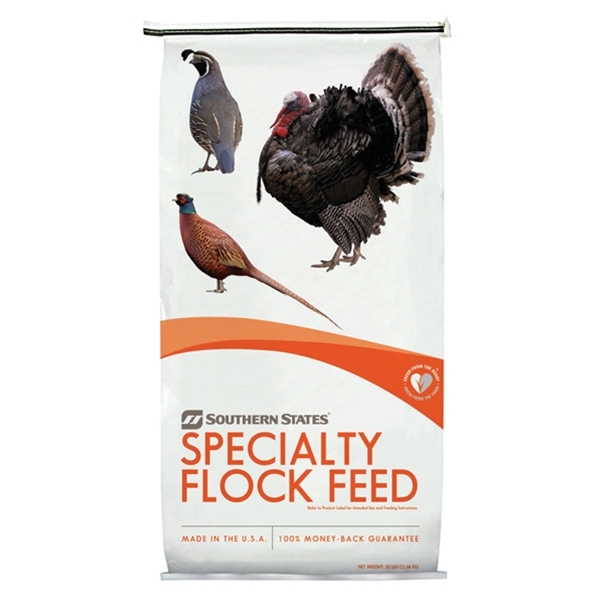 LIMITATION FOR USE: Feed continuously as the sole ration to growing quail and turkeys. Feed Sporting Bird Flight Developer (BMD) Medicated free choice to growing quail from the age of 8 weeks to release or market weight. Provide fresh water and feed to birds daily.